Dr. Criddle's passions are emergency, trauma, neuro, transport, and critical care. 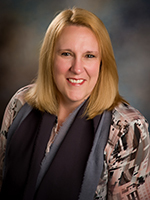 She is a nationally registered paramedic and board certified in emergency nursing (adult and pediatric), trauma nursing, orthopedic nursing, gerontological nursing, critical care (adult and pediatric), neuroscience nursing, stroke nursing, flight nursing, and nursing professional development. Laura holds advanced practice certifications as an adult acute care clinical nurse specialist and as a critical care clinical nurse specialist. Dr. Criddle has been a clinical nurse specialist since 1990, practicing as an emergency, trauma, flight, or neuroscience CNS at 5 health care organizations across the country. Throughout her career, Laura has cared for neonatal, pediatric, adult, and geriatric populations and has published over 100 journal articles, books, and book chapters covering a wide range of topics. She regularly speaks to health care audiences across the country. Dr. Criddle is a fellow of the Academy of Emergency Nursing, former chair of the Academy, case review editor for the Journal of Emergency Nursing, and a former editorial board member for the Journal of Trauma Nursing. Laura has held academic appointments at 4 universities and colleges and is the co-founder of TCAR Education Programs where she currently works as a clinical nurse specialist and serves as the company's chief clinical officer. Mr. Brock serves as the company's Chief Executive and Learning Officer. He is a veteran leader who has worked with startup, mid-sized, and fortune 500 companies in business and technology. Robert began his career in industrial television where he produced, directed, and edited scores of training and informational productions for corporate and ad agency clients. For the past 20 years, Mr. Brock has served in line, executive, and consulting management positions helping organizations establish, structure, or improve their business and technology strategy, programs and operations. Robert is certified in executive coaching, personality and leadership/team performance assessments, project management, Agile software development and is a Lean Six Sigma green belt. Mr. Brock holds a Bachelor of Business Administration and Marketing, a Master of Science in Computer Systems Design & Management and Robert is currently pursuing a doctorate in Educational Psychology. He is an ATD Master Instructional Designer and Advanced Online Learning Practitioner. Gretchen is our Operations Manager and Human Resources Manager. She is responsible for overseeing the day-to-day operations of our staff and ensuring everything runs smoothly at our office. Gretchen is also in charge of making sure our tradeshows and events go off without a hitch. Gretchen comes to us with a diverse background in bookkeeping, inventory control, event planning, and customer service. She enjoys spending time as a volunteer for several non-profit organizations and building relationships within her community. Renee works with Christine Downey to coordinate all the details of setting up and delivering a TCAR or PCAR class. Renee interfaces with our faculty, sponsoring medical facilities, and participants, to resolve scheduling, contracting, and registration issues. Renee has experience with shipping and receiving, tradeshow event coordination, and has business administration training from Western Business College. Christine works closely with Renee Dirks to put together our classes, from first contact to conclusion. Christine also engages one-on-one with facility hosts to ensure classes run without a hitch. When any host, faculty, or student issues arise, she is ready, capable, and willing to deal with them. Christine likes to keep fit by running and enjoys baking delicious cookies that she often brings into the office for everyone to enjoy. She has been with the company since January 2015. Kim is our staff accountant and is responsible to ensure that our day to day customers' and vendors' financial transactions are accurate and money flow is recorded and reconciled. She has over 20 years accounting experience in several different industries, including the A/P department of a large hospital, as well as over 30 years' tax experience. She holds a Bachelor of Business Administration in Accounting and is enrolled to practice before the IRS. She is married with three children and ten grandchildren. John oversees the creation and development of all our visual assets. This includes our offline collateral (such as brochures, trade show material and course delivery artifacts.) Before joining TCAR Education Programs he earned his BFA in Illustration and Design from PNCA. Since graduating he has worked freelance with clients as varied as a children's book publisher to the Multnomah County Bar Association to U.S. Senator Jeff Merkley. Victor earned his BFA in graphic and web design from The Art Institutes of Portland before coming to Visionem to assist in creation and development of our visual assets. Steve is a veteran technologist with over 30 years of software development experienced. He comes to us from ADP Dealer Services. There he worked on Automotive software applications including Manufacturing, Data Communications and the Service application. He holds a Bachelor's degree in Business administration from Portland State University. He is married with three children and two grandchildren. Tim is a software junkie and father of four. His passions include his family, Japanese language and cuisine, anime, writing, C++ game development in the Unreal engine, and 3D design. He loves all things electronic, and has always had a deep fascination with how things work starting with the very first line of Transformers toys, and manifesting in him being a self-taught, highly-motivated software engineer and IT specialist. Tim has been working with programming, computers, networking, and helpdesk support since 2000. His recent projects include custom software solutions for customer / client management and scheduling systems. Matthew is passionate about technology, the role it plays in our daily lives and how we interact with it. He is an advocate for continued education and believes the best thing one can do is expand their knowledgebase and hone the skills they’ve accrued. Web development and geeking out on Raspberry Pi projects are favorite pastimes as well as spending time in nature and playing board games with friends.